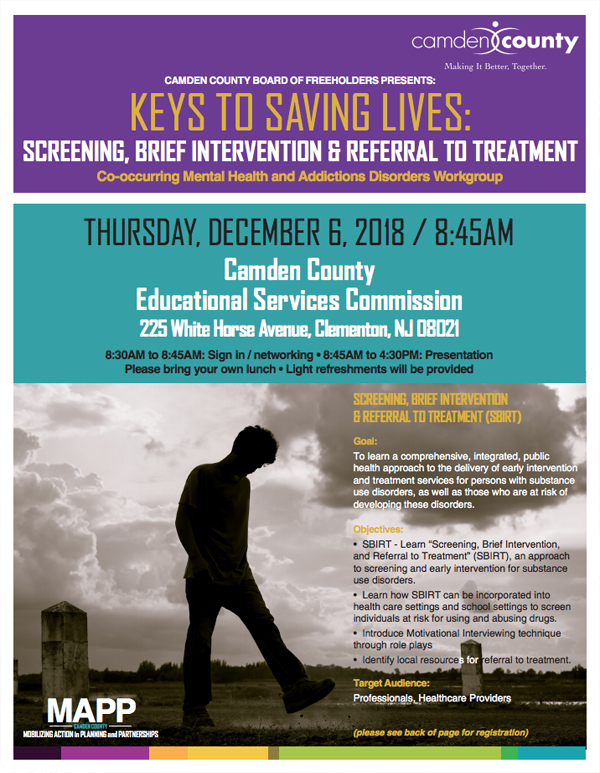 The Camden County Board of Freeholders presents “Keys to Saving Lives: Screening, Brief Intervention, & Referral to Treatment,” a mental health and addictions disorders workgroup, on Thursday, December 6th at 8:45 AM at the Camden County Educational Services Commission in Clementon. The goal of this workgroup is learn a comprehensive, integrated, public health approach to the delivery of early intervention and treatment services of persons with substance use disorders, as well as those who are at risk for developing these disorders. Space is limited so register early. Please bring your own lunch. Light refreshments will be provided.